I love finishing my jewelry creations with button closures, or using buttons as decorative elements in a jewelry design. On today’s Art Jewelry Elements blog post I shared my vintage glass button collection, as well as my collection of Thai cloisonné buttons and mother of pearl buttons. There are also multiple examples of jewelry that employs the use of buttons and resources for finding handmade buttons. You can check it out here: Button, Button, Who’s Got The Button. This woven bracelet features a beautiful green vintage glass button from Germany. This necklace also has a German vintage glass button closure, with a loop made of soft, round leather cord. This fun bracelet is made of intricately decorated handmade ceramic cubes and it closes with a button and seed bead loop. 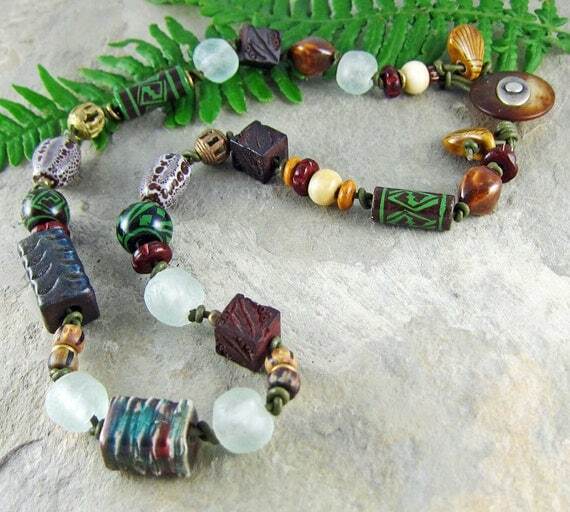 This rustic necklace is chock-a-block full of artisan components. It features a horn and metal button closure. Although Christmas is still 4 months away, I’ll share this last bracelet with you anyway. It’s hand-woven in Christmas colors and has a pretty gold button closure with a cut-out star in the center. So, now you can head on over to Art Jewelry Elements if you’d like to see some great button jewelry from other designers. This entry was posted in Art Beads and Components and tagged Art Jewelry Elements, bead blog, bracelets, button jewelry, buttons, Christmas bracelet, Christmas gift, glass buttons, handmade Christmas bracelet, handmade jewelry, holiday bracelet, Linda Landig Jewelry, necklaces, read and green bracelet, vintage buttons by Linda Landig. Bookmark the permalink. Love the Zigzag Zing bracelet. It looks really cool, the way you did the rings. Have always loved the way you use buttons, Linda. Haven’t see the raku necklace before – it’s awesome!